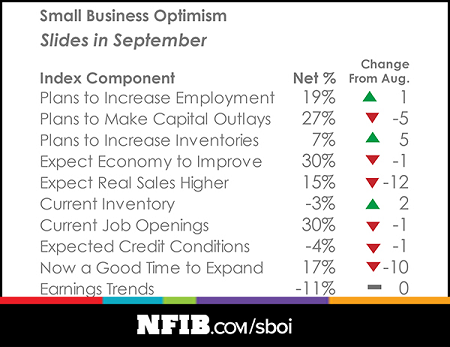 Today, NFIB reported the September Small Business Optimism Index results and they showed the Index fell 2.3 points to 103, which was below the lowest consensus forecast. In spite of the decline, the index remains at a high level as can be seen in the below chart. "Six of the 10 Index components dropped in September. Three improved, and one remained unchanged. The bright spot last month was inventory plans, which gained five points as more business owners anticipate a strong 4th quarter." One concern in the report is the difficulty firms are having finding qualified workers. Nineteen percent of owners indicated this was their single most important business problem behind taxes. For construction and manufacturing, it is the top problem in these two industries. 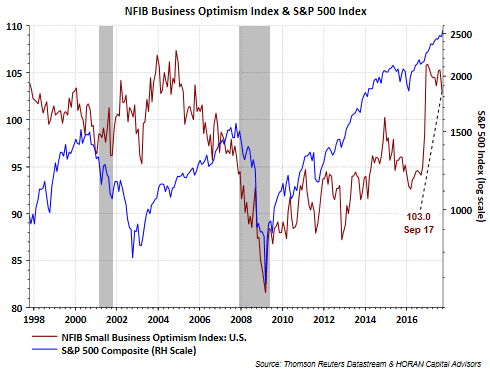 And finally, small business optimism is tracked as small businesses are the job creators in the economy. The December 2016 report that was released in January of this year pushed the NFIB Index to one of its highest historical levels. 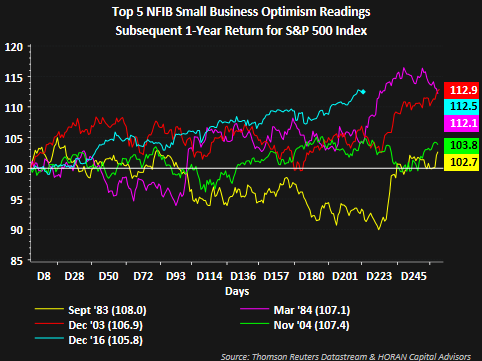 The S&P 500 Index's one year subsequent return from these high NFIB readings is displayed below. The market's performance since the December 2016 reading is tracking ahead of the market performance following the other four high readings.